Most leases are scanned as PDFs, making them difficult to search or machine translate. Most companies do not go to the trouble of converting them to a uniform access-friendly format. File conversion makes it simple to extract key data needed for financial reporting and for translation. The lease agreements folder would be accessible by everyone and everyone would know exactly where their files should go. Typically, an internal resource in a foreign office who is bilingual will be called upon to abstract the lease directly – skipping the translation process. However, being bilingual may not be sufficient to read a technical document such as a lease contract. Lay people oftentimes have trouble comprehending lease contracts in their native language, which is what bilingual internal resources may be if their training was only in one language. Moreover, validating that the work was done correctly may be challenging to people in the US office or even a third party auditor. 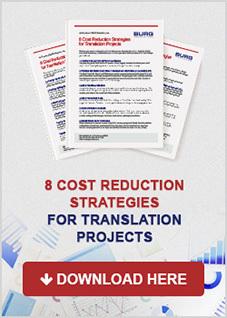 The standard translation process includes a professional translator and editor. This is excessive for the goal, which is sufficient comprehension to abstract the lease. The cause of this is requesting a translation company to translate a lease. Without explaining the purpose for needing the translation, the translation company risks applying an improper methodology. On the other extreme, machine translation is not sufficient for lease contract abstracting because machine translation translates words rather than meaning, and thus the meaning of the translation may be incorrect (it almost always is). The entire lease does not need to be translated by a professional; machine translation as a first pass is sufficient. However, to avoid misunderstanding the translation output, use a professional only on the sections of relevance. This is the most cost-effective approach. Finally, take advantage of machine learning technology and train the machine translation engine to learn from the professional translator. As a result, the machine translations improve with each lease. This exponentially improves both the speed and cost-effectiveness of this process. Partnering with a specialized translation firm overcomes this mistake completely. Keeping the translation of foreign leases in-house is not only incredibly time-consuming, but it is also expensive. Any translation firm will agree that a professional translator is less expensive than an accountant or nearly anyone else that works at an accounting firm. The opportunity cost of any internal resource dedicated to this task over any other more profitable task is immense. It is more cost- and time-effective to work with a professional translation firm who has deep experience translating foreign leases. The task will be handled with minimal resources and intervention. Contact us today to learn more about how to improve your lease agreement process.